Popular Android Application Including Whatsapp,Twitter,Facebook And GoogleNow Infected By "Trojanized Adware"
Lookout Security researchers discovered new malicious adware in android application.This malware is spreading through the popular android application and worst part is "it already infected more than 20,000 android application". Shuanet is able to gain root access to the infected device phone without the user’s knowledge, the threats install themselves as system service applications and are very hard to remove from the devices. The Lookout Researchers said that this ,Trojanized adware Shuanet are distributed through third-party repositories. The trojanized versions of the mobile apps are fully functional, for this reason, they don’t raise suspicion. It is important to note that threat actors behind the campaign avoided compromising antivirus apps, a circumstance that suggests a high level of planning when creating these malware campaigns. “While historically adware hoped to convince the user to install new applications by showing banners and annoying pop ups, now it can install these third party apps without user consent. In this way it can heavily capitalize on the Cost Per Install paid out by web marketing companies,” Lookout’s Michael Bentley said in a blog post. Kemoge and Shuanet adware share at least three exploits to root devices. The expert observed the majority of the Shuanet adware infections in the United States, Germany, Iran, Russia, India, and Indonesia. 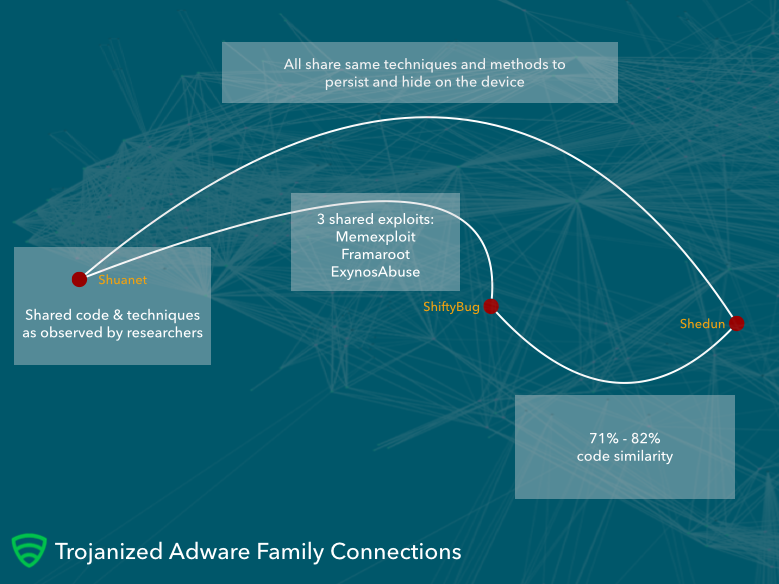 Lookout researchers believe that threat actors behind the adware campaigns Kemoge, Shedun and Shuanet are different groups, anyway the adware families appear to be linked. In some cases, the variants of malware analyzed share between 71 and 82 percent of their code, a circumstance that suggest the authors used the same pieces of code to build their versions of the auto-rooting adware.